Enter the dragon! Chinee Kong contains hundreds of authentic Chinese gong, bell, drum, and percussion samples. Five new evocative sampled Chinese instruments in virtual instrument form, at a seriously low price. There seem to be quite a few sample libraries containing loops or longer performances of indigenous musicians playing exotic instruments from around the world, but I much prefer to have the chance to play multi-sampled versions of the instruments themselves rather than simply pasting in some ready-mixed ethnic flavouring. With this in mind I was very pleased to discover Beijing-based developers Kong Audio, who have sampled an extremely impressive collection of traditional Chinese instruments (strings, woodwind, drums, and percussion) and released them on their Chinee Kong label. One of the developers is a professional film-score composer, and they can also get superb local players for their recordings for authentic sounds — as they themselves say 'there is a huge difference between our work and the usual 'windows on the world' type of ethnic collections'. All their instruments are conveniently packaged into reasonably-sized VST instruments that will run inside any VST 2.0 host application such as Ableton Live, Cubase, FL Studio, Nuendo, Project5, and Sonar. They are all PC-only, with sample-playback engines created using Jeff McLintock's Synthedit VST instrument and plug-in designer package that I discussed in SOS July 2004, and with graphic interfaces that range from utilitarian to extremely attractive. To keep prices down, all products are download-only, and although supplied in compressed format they are still large files, so a Broadband connection is mandatory. I had no problems with installation, although apart from the largest instrument, the sample banks must be stored with the VST instrument itself inside your Vstplugins folder. This is annoying for those who want to keep their sample libraries on a separate partition or drive, but is apparently a limitation of Synthedit. Another limitation is that, while the samples themselves were recorded in 24-bit, 44.1kHz format, Synthedit 's playback engine is currently 16-bit, 44.kHz, although I still judged audio quality to be excellent. However, such niggles vanish into obscurity once you see the UK pricing! Protection is by challenge/response — you simply get a pop-up window after about two weeks use and then have to email your unique Computer ID to Kong Audio to receive the corresponding key code. The response to my request was very quick, and the company even guarantee to provide permanently unlocked versions to all customers if they ever go out of business. All of the individual instruments in the collection are essentially constructed around the same Chinee Kong engine (although the percussion library has some differences that I'll come to later), but this engine does far more than simple sample playback. First of all there's global volume and pan, course and fine global tuning over ±1 octave, glide, pitch-bend in semitone increments over a one-octave range, variable glide, velocity-curve adjustment, plus (where appropriate to the instrument) a poly/mono option with low-, high-, and last-note priority options to accommodate various playing styles. Behind its bland facade Chinee Winds hides a wealth of expressive woodwind possibilities.You get an ADSR envelope controlling the loudness, and a selection of optional low-pass, high-pass, band-pass, and band-reject filters with cutoff and resonance controls to modify tonality. There's also at least one built-in effect — all the instruments include a handy reverb with control over size, high-frequency damping, room width, and wet/dry mix, while some also provide delay, tremolo, and tube distortion (of which more in a moment). However, the cleverest part of the engine comes from the performance options, which let you switch between up to four sets of multisamples per patch using velocity switching, C2/D2 MIDI keyswitching, and aftertouch/mod wheel. Sample Set A is played after you've pressed the C2 MIDI key, and Set B after the D2 key, but you can also switch at any time to sample Set C either by moving the mod wheel with your left hand or pressing down harder with your right hand on the MIDI notes to engage aftertouch. Where a fourth layer is on offer, this overrides Set A/B at higher MIDI velocities. I found the aftertouch option particularly expressive, as you can either trigger Set C by initially hitting the MIDI key harder, or move smoothly from Sets A/B to Set C during an existing note just by pressing harder. After a couple of minutes practice I found I could achieve surprisingly varied and expressive performances without the left-hand timing precision required by the keyswitching options of many Gigastudio libraries. Keyswitching between Sets A and B can be further adjusted by six controls that determine how the Set B samples are introduced, including an ADSR envelope, fine-tuning (on most instruments), and overall level. This means you can even crossfade from one set to the other mid-note without it being particularly obvious. The aftertouch/mod-wheel switching has its own similar set of controls, with some further refinements where a tremolo effect is on offer. Overall, like some of the most effective engines, this one's actually a lot easier to play than it is to describe, and provides a huge amount of tweakability for both the designer of the supplied patches and the end user. The first to be released in the series was the 355MB Chinee Winds collection, which contains seven woodwind instruments — two tenor Dizi, two treble models, two bass, and one Chao Zhou Dizi. These transverse (side-blown) bamboo flutes produce lively sounds with lots of natural resonance due to a buzzing paper membrane placed over a hole near the mouthpiece. This particular VST instrument offers tube distortion that can add some desirable warmth or grit, plus a second page of controls devoted to the built-in effects. These comprise tremolo with rate, depth, colour (fade-in time), and mix, and a versatile delay unit featuring separate left and right delay time and feedback controls, stereo width, low- and high-pass filters for the delays, and a wet/dry mix. The graphic interface is rather bland compared to the others, but thankfully the sounds more than make up for this, ranging from high and wiry down to low and breathy. The comprehensive Patch List describes the various sample sets utilised by each of the 54 patches, and they cover legato, staccato, trills, flutter-tonguing, various ornaments, runs, and glissandos, right up to short phrases typical of Chinese playing. A typical patch might offer legato notes in Set A, staccato in Set B, and special flourishes in Set C, so you can get a wide-ranging performance in real time. If you want further expression, there's also a MIDI controller list covering about fifty VST instrument parameters that you can modify in real time. This collection provides lots of evocative and mysterious sounds, and you can either play your own melodies complete with your own Chinese-style ornamentation, or incorporate authentic Chinese playing by using the short phrases offered in the later patches. There's so much variety in each patch that it can prove a little overwhelming at first, and I found Chinee Winds more difficult to play than the other instruments in the range, but stick with it and the results are well worth it! While you can easily find a few Chinese gongs tucked into orchestral percussion libraries, Chinee Kong is a far more comprehensive 500MB collection of percussion instruments sourced from various parts of China. It's currently the flagship product in the range, and there are once again very few loops — these are almost all single-shot samples, although there some longer single-shot performance flourishes including rolls. The library is spread among six main folders on your hard drive, each containing between five and 16 files, and covering six main categories: Luo (gongs), Nao Bo (cymbals), Gu Zu (drum sets), Ban Bang (wood percussion), Zhong Ling (bells), and Qi Ta (miscellaneous). You can load your choice of up to 10 files from disk, either with each one allocated to a different MIDI channel and available on its own audio output for further processing if required (Multi Out mode), or with all 10 modules mixed internally and emerging from a single stereo output (Mix Out mode). 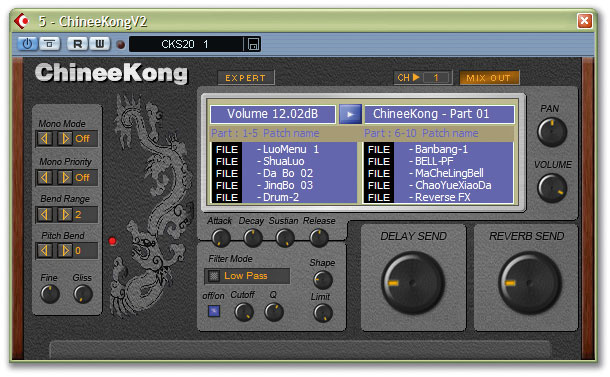 The attractive 'lacquered metal' interface features a Chinese dragon, with a blue central window where your file choices are displayed, above which is a blue button that determines what controls are displayed below the window — one of the sets of individual ADSR-envelope, filter, and effect-send controls for each of the 10 possible channels, or the Master Effects or Master Settings pages. On this instrument the Master Effects comprise the familiar Reverb module plus a Sync Delay featuring a similar array of controls to that of the Chinee Winds, except that delay times are locked to the tempo of your song. The Master Settings let you control the velocity response, key range, and velocity ranges for each of the 10 parts, as well as route them to any of the 10 stereo outputs that appear in your host application. For even more performance versatility, there's an Expert switch that activates a keyswitch feature so you can trigger all 10 channels from MIDI channel one, but switch between the sample sets using MIDI notes C1 to A1. I've already got a reasonable selection of gong sounds in my sample library, but the Chinee Kong collection goes way beyond any collection I've heard before, ranging from the classic evolving whooshes and low drones through mid-range pitch-benders right up to tiny pangs, splashes, and tings. The Cymbals often sound quite unlike those used with Western drum kits, and cover a huge range of sizes from tiny finger cymbals to big clangers, supplying scrapes, hits, crashes, rolls, and even a few performance loops. There are loads of drums, ranging from gigantic reverberant booms, thunderous hits, synchronised cymbal/voice/drum combinations, and barrel drums, through to resonant taps on smaller hand drums, while the wood percussion comprises frame drums plus lots of clave and almost castanet-like hits and rattles. Across the bell files you get lots of tiny finger cymbals, purer-toned plait bells, deeper temple bells, carriage bells (similar to sleigh bells), delicate ancient bells, plus some tiny chimes and almost cowbell-like instruments. The final folder contains various percussive combination hits and phrases from Chinese opera, several 'menu' sets containing a wide range of instruments from elsewhere in the collection for quick access, a stray Tibetan Horn, some snippets from live performances to give you some idea of how the instruments should be authentically played, some backward gongs and cymbals, and even some heavily treated electronic sounds that started life as Chinese instruments! The two bowed strings of the Erhu sound very different from those of a Western violin, but the Chinee Erhu samples have been played by a talented performer who does all the hard work for you. Although none of these Chinee Kong sounds are velocity-layered, their scope is huge — each set spans five octaves and some provide different sounds on almost every key. Personally I'd far rather have a huge collection of sounds like this than a hundred multi-layered samples from a single instrument that I can rarely fit into my music, so I shall be reaching for this Chinee Kong collection a lot in the future. The 200MB Chinee Erhu was the third in the series to be released, and is a traditional bowed instrument with two strings (Er means 'two' in Chinese), a small body, and a very long neck. It sounds very different from the Western violin, largely because of the nasal tone resulting from its snakeskin-covered resonator and silk or metallic strings. It's played upright rather like a cello, is widely used in China for music as diverse as opera and film scores, and also featured heavily in Ryuichi Sakamoto's score for the film The Last Emperor. Apart from a wood-grain front panel and the different arrangement of controls, the Chinee Erhu engine is almost identical to that of the Chinee Winds, down to reverb, tremolo, and delay effects, so I'll concentrate on the sounds. This VST instrument contains extensive alternative expressions of legato, vibrato, loud-soft-loud swells, staccato, pizzicato, tremolo, glides, trills, and virtuoso 'fills', all accessed via the clever switching described earlier. This time there are four sample sets, the fourth one activated by higher velocity values. I loved the haunting sound of this instrument, its pitch swoops and longer performance flourishes, and if you want some authentically played Chinese bowed strings in your music this is the cheapest way by far to get them. With a gorgeous interface and a host of performance options, the bendy plucked-string sound of Chinee Guzheng is my favourite in the Chinee Kong range. This traditional Chinese zither (also known as the table harp) is claimed to be the ancestor of the Japanese Koto, and has developed from a fairly simple five-stringed instrument to the modern 21-string version. It is generally tuned to a pentatonic scale and played with small plectrums attached to several fingers of the right hand, while the left hand presses the strings on the other side of the bridge for pitch-bends and the like. To my eyes, the graphic front end of the Chinee Guzheng is by far the most attractive of the collection, with its faux engraved wooden front panel and ivory and ebony control knobs. It also features a Sound Type control that switches the stereo channels to mono, but provides separate sliders for the Set A and Set B layers so that you can create your own mixes, although it omits the more elaborate filter and effect sections of its brothers in favour of more subtle high and low filters and a single reverb effect. It offers three sample sets totalling 210MB to provide real-time access to another impressive range of legato, tremolo, strumming, fast picking, pitch-bends, harmonics, knocks, plus a good selection of harp-like glissandos. With 66 wildly expressive patches this is another tour de force. There are plenty of taster ethnic collections. The Best Service Ethno World series features lots of sample loops and licks covering a host of ethnic instruments in Akai, Emu, and Gigastudio sample formats, but East West's Orient World is rather a misnomer, as it offers Middle Eastern instruments rather than Far Eastern ones, as does Sonic Implants' Silk Road sample collection in Gigastudio or Kontakt formats. I loved East West's Rare Instruments collection when I reviewed it back in SOS September 2001, and it's now available in a much more comprehensive 14GB version with loads more loops. It includes the Far East as one of the six geographical areas, and even has an Erhu in the collection. However, as far as I can see there's nothing that really offers a comprehensive range of authentic Chinese instruments like this Chinee series. The final instrument so far available in the series is the Nan Xiao, a quieter end-blown bamboo flute with a melancholy tone that's popular in Southern China. This VST instrument features another wooden panel, plus a similar engine to Chinee Guzheng — there's a single reverb effect, although this time the four filter types with resonance are back. However, like Chinee Erhu, this instrument features up to four sample sets assigned to each patch — Set A/B accessed by keyswitching, Set C above a certain velocity whichever keyswitch you're using, and Set D via aftertouch/mod wheel. The Chinee Nan Xiao bamboo flute can provide haunting slow melodies or fast virtuoso flurries of notes. The 63 presets once again offer wide expression options, covering legato, staccato, tremolo, piano and forte, slow/fast bends up and down, various trills and other articulations, and there's some clever programming going on. I particularly liked the legato/tremolo combinations, where you could shift to the tremolo samples by digging in harder at any time during a note when it feels natural — in most cases the crossfade sounded seamless and far more expressive than the automatic delayed vibrato incorporated into so many other sample library collections. Other highlights include patches offering three types of trill or bends and the 14 different articulations/phrases arranged in different combinations for some wonderful performance possibilities. I found myself permanently in record mode during the course of this review, simply because I didn't want to lose some of the fascinating stuff I found myself playing. To combat piracy, Kong Audio have perhaps wisely decided not to provide demo versions of their complete instruments, but apart from plenty of MP3 examples for each full instrument in both classical and modern styles, you can also download complete Mini Dizi and Mini Erhu instruments that provide a taster of the full experience, as well as the Small Host application which will play any one VST instrument in stand-alone mode. Although sample playback is at 16-bit, 44.1kHz I found the audio quality very good, although I did find the built-in reverb rather basic and often preferred to switch it off and patch in my own plug-ins. However, as you've probably gathered, I loved this collection for its authentic and exotic sounds, plus its real-time playability. Overall, whether you want your taste of the Orient to be a quick snack or a five-course meal, the Chinee Kong range provides a truly authentic flavour that satisfies. Authentic Chinese instruments played by talented Chinese performers. Superb playability with real-time switching between up to four sample sets in real time. Some instrument graphics are rather basic. These Chinee instruments should be snapped up by any PC musician who wants a taste of the orient, before Kong Audio come to their senses and put the prices up! Chinee Winds, $68 (around £36); Chinee Kong, $88 (around £46); Chinee Erhu, $60 (around £32); Chinee Guzheng, $60; Chinee Nan Xiao, $60; Big Bundle of all plug-ins (including new Chinee Pipa instrument), $316.8 (around £167).